When you use the Kendo UI Grid or Tree List widgets in an AngularJS application, you will probably notice that with long grids/lists or with many columns, you’ll end up having quite a few watchers created (basically one watcher per cell). Unfortunately, it is not (yet) possible to use one time binding. The AngularJS documentation recommends keeping the number of watches under 2000 in order not to hurt the application performance (because it otherwise creates a high load during digest cycles). The reason why so many watches are created is that the Kendo UI directives compile (using $compile) all cells so that you can use angular expression and directives in you column templates. Disclaimer: All the instructions below only make sense if you do not need two way binding in your grid or tree list rows. If you do then you actually need these watchers. Of course, if you use a Grid and not a Tree List, you’d use kendoGrid instead of kendoTreeList. Since we’re not in the Angular world anymore, the templates are not compiled anymore (that’s after all that’s what we wanted to prevent). So you’ll need to add the logic you had in the template to the method defined as data source. In my example above, I’d call versionFormat for every row and replace dataItem.Version by the output value. AngularJS factories (and services) can contain both methods (business logic) and properties (data) and can be injected in other components (e.g. your controllers). This allows you to define a shared variable in a factory, inject it in both controllers and thus bind scope variables in both controllers to this factory data. No matter which “+” button you press, both values will be incremented (or rather the shared value will be incremented and reflected in both scopes). In general, it’s much cleaner to encapsulate the shared data in dedicated factories or services which are injected in the components which require access to this share data than making these data global variables in the root scope. In this case there is effectively no further propagation of the event since the root scope has no parent scope. It is thus the preferred way to propagate events to unrelated scopes (and should be preferred to $broadcast in such scenarios). Effectively, the second use case doesn’t make much sense since you would basically trigger an event on the root scope and propagate it to all child scopes which is much less efficient than propagating and listening to events on the root scope only. Both $emit and $broadcast dispatch an event through the scope hierarchy notifying the registered listeners. In both cases, the event life cycle starts at the scope on which the function was called. Both functions will pass all exceptions thrown by the listeners to $exceptionHandler. An obvious difference is that $emit propagates upwards and $broadcast downwards (in the scope hierarchy). Another difference is that when you use $emit, the event will stop propagating if one of the listeners cancels it while the event cannot be canceled when propagated with $broadcast. $timeout will by default execute a $apply on the root scope after the function is executed. This will cause a model dirty checking to be run. $timeout wraps the call of the provided function in a try/catch block and forwards any thrown exception to the global exception handler (the $exceptionHandler service). All parameters of $timeout are optional (although it of course doesn’t make much sense to call it without any parameters). The first parameter is a function which execution is to be delayed. The second parameter is a delay in milliseconds. You should now rely though on the delay to be absolutely respected. The minimum delay should be of 4 milliseconds in all modern browsers (you can set a smaller value but will probably not see a difference). The third parameter is a flag (i.e. boolean, true or false) which when set to true, will cause $timeout not to execute $apply once the function is executed. All additional parameters will be handled as parameters for the provided function and will be passed to the called function. This will basically execute executeInTenSeconds(10); after 10 seconds, trigger the global exception manager in case of an unhandled exception and run a digest cycle afterwards. After 10 seconds our function will be called, it will change the value of a scope variable and after that a digest cycle will be triggered which will update the UI. When the third parameter of $timeout is set to false, $timeout will skip the $rootScope.$apply() which is usually executed after the provided function. The advantages of this approach are that it’s very easy to handle and switching to the second or third view is extremely fast as everything was already loaded upfront. So with this approach the time required to switch from the initial view to another view is increasing (because you now need to load some resources first) but the initial load time is decreasing. In order to get a low initial loading time and not require any loading time for the second and third view, you need to implement some asynchronous solution which relies on the fact that files which have already been loaded will not be loaded again and that the user usually doesn’t immediately switch to the second or third view. The delay introduced by the user could be because he needs to enter some credential in a login page. Or the initial view is some kind of dashboard and the user will first review all displayed information before going to more detailed views. 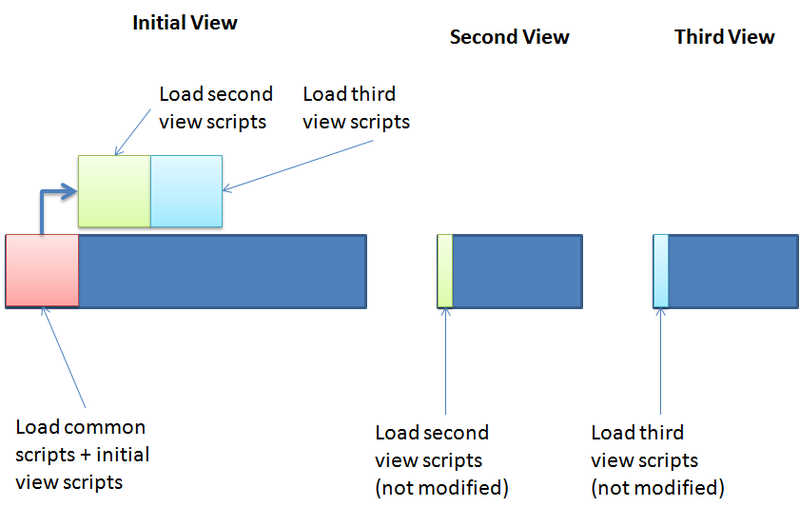 When the initial view is displayed, we require scripts needed for the other two views to be loaded asynchronously. So while the user is interacting with the initial view, the scripts are loaded in the background and once the user activates one of the other views, the scripts will not be loaded again. The problem with the first option is that since it triggers the asynchronous background loading of the files immediately, these load operations will compete with the loading of other resources you are waiting for. This means that it will use some of the bandwidth you need for the synchronous loading of files and it will also use HTTP connections which might cause the other load operations to have to wait. If you are dynamically loading files for the new view in your resolve function, putting the code to asynchronously load files you will need in the future has the same effect. It’s just maybe not that bad because the files which are lazy loaded might be less or smaller than the ones which are required for all views and loaded upfront. So the solution I went for is the third. Since the background loading is triggered once the required files for the view have been loaded, it has no impact on other load operations. Of course, introducing lazy loading and asynchronous background pre-loading increases the complexity of your application. And it is not trivial to introduce once you already have a large application which dependencies are a mess because you never need to clean them before (since by default AngularJS causes all files to be loaded upfront). Does lazy loading always make sense? First, as general rule, optimization should only be performed when you actually have a performance problem. Definitely not in a prophylactic way. This is a common error made by many software engineers and causing complexity to unnecessarily increase at the beginning of a project. If you identify a bottleneck while loading specific resources, you should start thinking about introducing lazy loading in order to speed up your app e.g. during initial loading. Also loading resources on demand means that when the user of your application activates a view which has not yet been loaded, he first has to wait until the additional resources are lazy loaded and properly registered. When you load everything upfront, the user has a longer wait time on application load time but can immediately access all views in your application without delay. So using lazy loading always means having a tradeoff between initial load time of the application and subsequent activation of parts of your application. What’s the point of lazy loading ? Lazy loading components generally improves an application’s load time. If your web application takes many seconds to load all components ever required to interact with user, you will most probably experience a high bounce rate with users just giving up before they even get a chance to see how great your application is. By lazy loading parts of your application, you can make sure that the views in your application which are used immediately by most users are available immediately. If a given user decides to use other (e.g. more advanced views), the application starts loading required components on demand. Especially if you are building a web application which can be used on phone and tablets (which represents about 60% of the total web traffic now), you have to consider that most users will not have a 4G mobile connection and initial load times can become prohibitive in an environment where the download bandwidth is limited. Loading time is a major contributing factor to page abandonment. The average user has no patience for a page to take too long to load. Slower page response time results in an increase in page abandonment. Nearly half of web users expect a site to load in 2 seconds or less, and they tend to abandon a site that isn’t loaded within 3 seconds. So improving the initial load time of your web application is critical. And this is the main use case for lazy loading. When and what to lazy load ? As explained above lazy loading makes sense when you want to reduce the initial load times and are ready to accept that loading additional views might not be instantaneous. Ideally, at some point in time during the run time of your application, you would be able to determine that the user will need a specific view and load it asynchronously in the background. Unfortunately, this kind of smart lazy loading is very difficult to implement for two reasons. First, it is not so easy to predict that a user will need a specific view. Second, asynchronicity introduces additional problems which increase the complexity of your application. This is why lazy loading is mostly implemented in such a way that when a user activates a view (or a sub-part) of your application which hasn’t yet been loaded, it is loaded on the fly before displaying it. First load everything upfront (this is how most desktop applications work). If you face problems because of high initial load time, continue optimize. Otherwise you are done. Lazy load individual modules of the application. This is the way I handle lazy loading in the application I used as a basis for my previous post. If the load times are acceptable, then stop optimizing. “Acceptable” could either mean that the load times for all parts of the application are good enough or that the load times are good for 95% of the use cases and the user only has a longer wait time for rare use cases. Until the performance is acceptable. You cannot organize your application in multiple AngularJS modules. This doesn’t work well for third-party party AngularJS modules. That’s why you need to additionally handle the invoke queue, config blocks and run blocks when lazy loading new AngularJS modules. AMD module as used in RequireJS. These modules just encapsulate a piece of code which has load dependencies to other modules. These are designed for asynchronous loading. When I reference modules in this article, I mean the second kind of modules. I hope that with this article I made it clearer, why lazy loading AngularJS modules is not a stupid idea but should be handled carefully. You need to make sure that you choose the right level on which to lazy load components. And if you need to split your application in multiple modules or use third-party modules, it is definitely not sufficient to use most of the mechanisms you will find by quickly googling for lazy loading in AngularJS. Using RequireJS is definitely a first step in the right direction but you need to make sure that the loaded scripts are also made available to the AngularJS dependency injection container. When you click outside of the <span> doSomething() will be called. But when you click on the <span> both doSomethingElse() and doSomething() will be called. This is because of event propagation. The click is processed by doSomethingElse and then the event propagates to the parent of the <span> tag i.e. the <a> tag and triggers doSomething(). Actually the fact that it’s an <a> tag doesn’t make much of a difference. If you replace the <a> tag by a <div> tag, you’ll get the same results. // frequently as regular change detection. So it’s not returning the return value of the function used in ng-click. So we have two ways of solving this. But one of the things which was bothering me was that I always ended up adding some libraries/modules and forgetting to add them to my index.html. And sometimes after the list of loaded scripts grew quite a lot, figuring out where to insert this new script tag is really a pain. This will load AngularJS, then load your app and then bootstrap your application. Introducing RequireJS is actually quite some work (if all your files and modules are already there) but not really complex. The main issue I have faced was that there is no explicit dependencies between AngularJS and JQuery, so they might be loaded in any random order. If AngularJS is loaded before jQuery, it will revert to using jqLite which is definitely not sufficient for jQuery UI. This will lead to strange errors occuring. So what you need to do is make sure that jQuery is loaded before AngularJS. This can either be done by setting priorities in your RequireJS configuration (only works with RequireJS 1.x) or by making jQuery a dependency of AngularJS (in the shim section of RequireJS 2.x – see example above). The first kind of dependencies is now managed by RequireJS instead of having me manage it in index.html. The other two have not changed. Moreover, my application still looked like a big monolithic application at runtime since even though the file load order was now computed by RequireJS based on dependencies, I was still loading all files and interpreting them at application start. No matter whether some modules, controllers, directives… might only be needed much later or for specific users not at all. There are different levels of lazy loading which can be achieved in AngularJS (having different levels of difficulty and restrictions). This makes sure that your controller doesn’t need to present immediately but that the resolver function will be called when this route is activated. The resolver function returns a promise we create using $q.defer. In order to load all required files and AMD modules, we wrap the logic in this function in a require block. Once the loading of the script and all dependencies is done, our callback is called which just resolves the deferred object. This approach works well and doesn’t require much additional code but it only works if the controller you’re lazy loading is controller on an existing module. And even if it is the case, you’ll notice it doesn’t work that well, when the controllers you are lazy loading bring their own dependencies (other modules with controllers and directives). So to have a more robust and versatile solution, we need to be able to register and activate AngularJS modules dynamically (and the modules on which they are dependent). When a module is registered, AngularJS checks whether all referenced modules are available. Whenever you call a function on your module (e.g. config, run, controller, directive, service…), it just pushes the provided function to a queue. In case of config, the queue is module.configBlocks. For run, it goes to module.runBlocks. For the others, it’s module.invokeQueue. On module load, AngularJS will concatenate the run blocks (but without executing them yet), run the invoke queue and then run the config blocks. Once the modules are loaded, all run blocks will be executed. Now that we can we can register modules dynamically, we’re only one step away from defining views which can be plugged into our application. Imagine you have an application, with multiple views showing different (possibly unrelated) data. If you want others to be able to extend your application, you need to provide a way to define a pluggable view and load all such views setting the appropriate routes and providing some model which can be used to display the corresponding navigation links. In this example, the pluggable views registered are hardcoded in my application but having a separate file containing the view configuration is fairly easy and would be a way to make your views truly work as plugins. So that’s it for this post. We’ve build an provider which allows us to register views on the fly considering their dependencies and allowing the navigation bar or panel to be extended. Of course, you’ll still need to add some error handling, some logic to make sure that modules you depend on do not get activated multiple times… But this is all for a next post. In one of my AngularJS projects, I am using the angular-split-pane directive which is basically wrapping the split-pane JQuery plugin. This directive finds out how to split the panes and position the slider by reading the height and width attributes of the HTML tag. I needed to add a functionality to my application so that the position of the slider is written to some session file on the server and reused next time the application is started to reposition the sliders at the same position, basically setting the height of the lower pane in percentage. The previous position is fetched using $http. The problem is that it runs asynchronously and by the time the results are there, the directive has already been processed and changing the height tag has no effect anymore. You can define the order in which directives are run by setting the priority property. But I needed a way to have the directive processed after the results from the server were available, not after or before another directive is processed. After searching for a solution for quite some time, I finally find a way of implementing it late at night. This is actually pretty simple but for some reason it took me forever to think about such a solution. Of course the small disadvantage of this solution is that my UI is first shortly rendered without the split pane and when the data has been fetched, the split-pane is also rendered. In order not to have a partial rendering of the UI, you could of course move the ng-if attribute higher in your HTML code so that the whole UI is only rendered once the data from the server is available. If your directive is not replacing the DOM element but just manipulating them, another solution would be to have the logic run asynchronously using $timeout and repeat until the data from the server is available. Or having it applied once the data is available by using $watch. I am working on a project in which based on some user interactions I am calling a service on the server and receive some pieces of HTML code which I need to display in the UI. Error: [$sce:unsafe] Attempting to use an unsafe value in a safe context. When initialized, Plupload puts an overlay above the browse button. This unfortunately only works if this element is displayed. If it is not displayed, the Plupload initialization will fail. When working with dialogs, this means you need to execute the initialization of Plupload once the dialog is already displayed. You will see that although you do not get any kind of error, nothing will happen when you click on the browse button. This is because no overlay was added by Plupload. If you put a breakpoint in the controller code, you will see that the dialog is not yet displayed when the code runs. Now we know the root cause of the problem, all we need to do is either call the refresh method after displaying the dialog or just initialize Plupload after displaying the dialog. The problem is that I never found out how to provide a callback to get triggered after the dialog has been displayed. Now your browse button should be working.